Another Trump Support Rally. Only One Protester This Time. 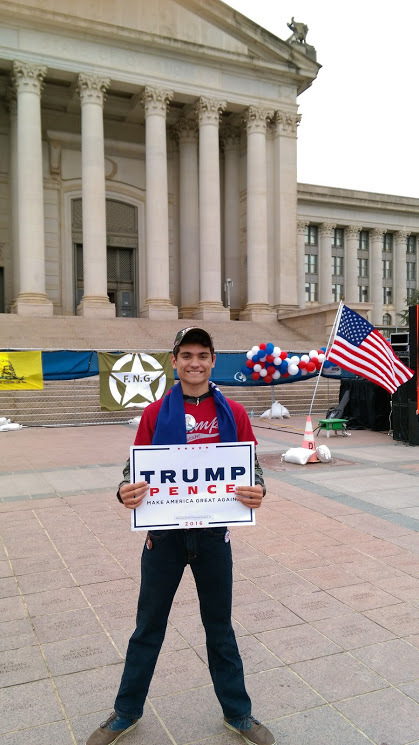 On March 4th, my 17-year old son David and I attended a Trump support rally (See Attending A Trump Support Rally–It Was Fun, There Were Demonstrators And They Had Interesting Signs ). 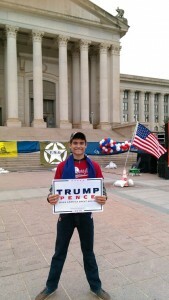 Well, on March 25th there was another one at the same location, in front of our state capitol. David and I went again, along with my other son Raphael (14) and my niece Ginger (17), also an avid Trumpster. It was fun, although with fewer people there. It was colder. Just as before, seeing the crowd and meeting people was the high point. We met a pro-Trump Mexican-born lady there, brandishing a sign that said “Dios Bendiga U.S.A.” (God bless the U.S.A.) She was talking about how her mother (a U.S. citizen) watches Univision and is now afraid the government is going to take away her citizenship. Well, what do you expect after a steady diet of Univision? Here’s an article on the rally, with a video. 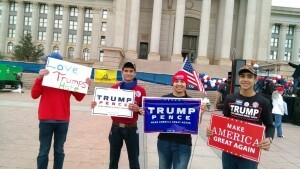 My sons and niece appear right near the beginning, brandishing Trump signs. My niece was interviewed at the rally and excerpts of her interview appear three times. At other times thoughout the short video, my sons and very briefly, yours truly, are visible.